Project Introduction: Madhupur, Tangail is located in middle of Bangladesh, suffering from long periods of heavy rain and dry weather. 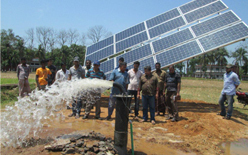 The crop growth requires adequate water source, by utilising Solartech solar pumping agriculture irrigation system, the irrigation water short supply problem was successfully solved. The project have caught attention and support from Ministry of Agriculture in Bangladesh. Solution: Solartech PS4000 solar pumping agriculture irrigation system was applied in this project, integreted with sun tracking system, the system can produce water 500m3/day at 10m lift head. The system is now providing sufficient irrigation water for rice, jute, wheat and cotton. Economic Benefits: 14,016kWh of electricity generated annually; 131.8 tons of coal saving in its 25-year service life; 58 tons of CO2, 2.6 tons of SO2, 2 tons of smoke and 34.3 tons of ash reductions in its 25-year service life. According to World Development Indicators 2011 published by World Bank, every cubic meter of water consumption could contribute 1 USD to Bangladesh's GDP, in the system 25-year service life, over 4,500,000 cubic meters of water will be produced by solar energy.